December 04, 2018 - "Press Releases"
Londonderry, NH, September 28, 2018 – Admix, Inc., global leader of advanced mixing technologies for the food/beverage, pharmaceutical, and cosmetic industries, will be showcasing its full range of mixing, milling, and powder induction solutions at Pack Expo International 2018 taking place in Chicago, IL from October 14 – 17, 2018 at McCormick Place. Admix will be in booth E-8931 at the Lakeside building, level 3. Visitors to the booth will learn how Admix in-tank and inline mixing equipment dramatically improves productivity, lowers operating costs, improves end-product quality, and ensures operator safety. Solutions on display will include high shear and high-speed mixers, high shear emulsifiers, high intensity wetmills, powder induction and dispersion systems, static mixers and low shear agitators. Rotosolver® - The unrivaled Rotosolver is a patented high shear batch mixer, offering 100% wetting out of powders and an easy-to-clean, low maintenance design. The Rotosolver delivers high intensity, high shear, high-speed mixing and dispersing for volumes up to 10,000 gallons. DynaShear® - The DynaShear is a high shear, high speed mixer and emulsifier for continuous processing. Constructed of 316 SS, its unique dual stage axial and radial heads provide optimal throughput and flow. Fastfeed® - The Fastfeed is a fully integrated skid-mounted system with an ergonomic operator table and features a two-stage rotor/stator high speed, high shear disperser and a powerful suction pump. It instantly and completely wets and disperses powders inline at the particulate level at rates up to 450lbs per minute. Boston Shearmill® - The Boston Shearmill is a high intensity wet mill/homogenizer. For processes requiring milling of soft particles to <1 micron, or hard particles down to 1-2 microns, the Boston Shearmill produces superior particle size reduction, often in just a single pas at high production rates. Admixer® - The Admixer is an all-stainless sanitary static mixer and blender ideal for processing miscible fluids regardless of flow rates, viscosity or density. Benchmix™ - The Benchmix benchtop lab mixer is ideal for product development and formula optimization and available with multiple high shear heads and low speed impellers and props. Rotostat®- The Rotostat is a rotor-stator mixer with an optional lower prop that provides optimum shear and pumping rates for lump-free dispersion, hydration and emulsification. 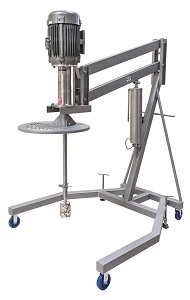 Rotomixx® - The Rotomixx is a low shear batch mixer available in either portable or fixed mount configurations. Rotomaxx™ - The Rotomaxx is a high torque, high flow, right angle mixer for larger tank volumes requiring rapid turnover and high efficiency agitation. FlowShear® - The FlowShear is a bottom mount emulsifier and disperser that delivers high shear and high flow in a compact design, enabling processors to mix a wide range of batch sizes with minimal starting liquid levels. Admix experts will be on hand to share their insight, advice, and offer customized solutions for your unique application. Stop by to see the Rotosolver high shear mixer in action, watch videos, or learn about complimentary lab tests or in-plant equipment trial programs.